Running is simple: you put one foot in front of the other for however long you want to run. Becoming a runner isn’t quite as straightforward. Being a runner is a state of mind. You are a runner when you say you are a runner. As you start, being to think of yourself as a runner. 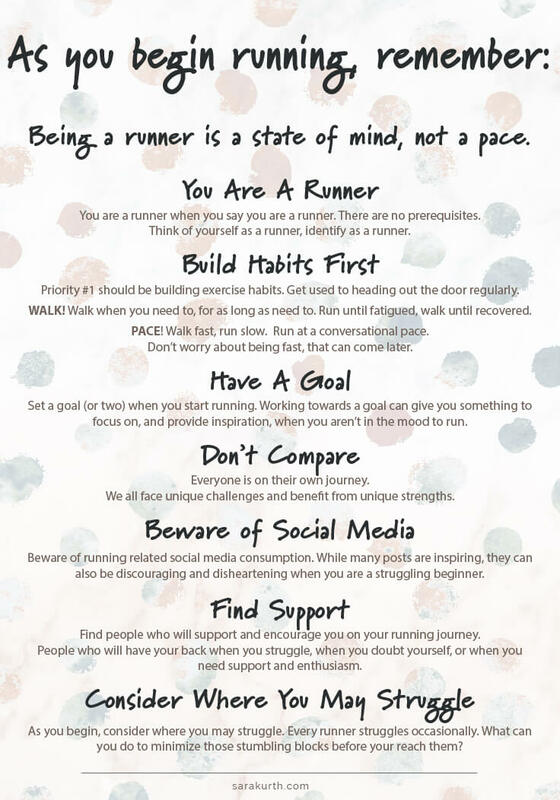 Identify as a runner. Make it part of who you are, regardless of your pace or how long you can run without stopping. Do not skimp on the shoes. A cheapy pair, that pair that’s been in your closet for years or hand-me-downs don’t cut it. Go to a specialty running store and get a pair that is suited to you, your body type, and your running style. Get a good, supportive running bra. The price tag can be shocking, but is worth every penny: the ladies bouncing everywhere can be very unpleasant. I always say: a good pair of running shoes made me a runner. A good jog bra kept me a runner. I’d consider every other piece of gear optional and nice to have. You can get just the right GPS watch, the perfect top or jacket, and great running tights as you need them and as you have a better idea of your needs. Too much time preparing and shopping at the start can be a procrastination technique and a way to keep yourself from running. So get your shoes and start running! Good running form is key to staying healthy. And yes, you do need to learn how to run. It seems like a simple extension of walking, but it isn’t. Check in on your form regularly since your form can get worse as you fatigue. I’m a big fan of the Chi Running philosophy – they have lots of great pointers on form. Don’t leave your runs up to what you feel like doing. Trust me: you’ll feel like sitting on the couch, not running. Working towards a goal will help you get out the door on days when you just aren’t feeling it. Finishing a race is a good first goal, but if the idea of running a race doesn’t inspire you, feel free to pick anything else that does inspire you. I am a big fan of running journals. As you take up a new activity, journaling about your runs, how they went, how you feel about them, and what works and what didn’t, can help you stick with it. Keeping a running journal can increase your confidence and help bust your lack of motivation. I have created a 4-week running journal to get you started, it can be found in my Beginning Running Bundle. Not quitting running comes down to one simple task: Don’t let the excuses win. Notice I said simple, not easy. Intimidated by the idea of doing a race IRL or just want to try something new? Try a virtual race.